Click fraud costs advertisers billions every year. SecureAd by Oxford BioChronometrics finds the bots that waste your money. even the most sophisticated attempts at ad fraud. 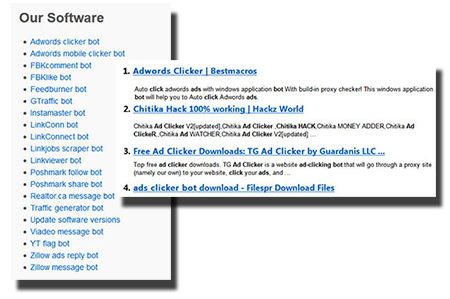 Just add a line of code to your site to detect and track ad fraud from any advertising source. SecureAd for Search reliably scans for bots and ensures you know exactly how many bots and humans are clicking on your ads. Knowing which of your users are human means you can measure the true cost of engagement and plan better while holding your partners accountable. Knowledge really is power. No matter how you publish your ads, you can start to detect and track ad fraud in just minutes! SecureAd for Search works with all search engine advertising systems and social media sites. You won’t need to change a thing about how you work. Just add our code and go. Want to see SecureAd in action? Just drop us a line to set up your 14-day trial for free! You’ll be glad you did. We understand – you want to know what kind of fraud your ads are subject to and you want to know now. That’s why SecureAd for Search reports the fraud as it happens on your dashboard. Keep track of your stats on your own dashboard. You can even import a report from your exchange to directly compare stats. Just ask us how! You want to know what kind of fraud your ads are subject to and you want to know now – because decreasing ad theft means increasing revenues . That’s why SecureAd reports the fraud as it happens on your dashboard. SecureAd has been white listed and certified by most major advertising exchanges and will work with any publisher, social media site & search engine ad system. Just ask us to confirm that we’ll work with yours, too. SecureAd puts its definitive behavioral analysis to work for you to eliminate the guesswork IP-based blacklists use. SecureAd gives you certainty about the ad fraud you’re exposed to so you can calculate the real cost of engagement. Knowledge gives you the power to protect your budget. Keep track of your stats with a detailed, private dashboard. Statistics and raw data are at your finger tips and easily exported for your reporting needs. Looking for certain details about your latest campaign or just want to examine your raw data? You can auto-generate reports straight from your dashboard to see the kinds of fraud your ads are exposed to. You’ll have actionable data and context to help you keep your partners accountable. Ad fraud is on the rise. Fraudsters know how standard solutions try to stop them – and they simply work around them. What’s more, they even advertise freely that they are inexpensive ways to fake popularity. They even encourage users to target and eat up a competitor’s monthly budget! The challenge must be met. With SecureAd, you can beat it. SecureAd analyzes real-time behavior with advanced biochronometric algorithms, so you’ll know for certain when there’s an invalid click and when a user is a human. IP-based solutions are only guesses based on past performance. A recent study by the Association of National Advertisers showed that 67% of bot traffic comes from home computers with viruses. That means 67% of the time, a guess could be wrong! Ad fraud is too costly to guess at. With SecureAd you can know for sure. Built on the science of cybersecurity, SecureAd measures the behavior of anything interacting with a digital ad in real time to determine if it is a bot or a human. Multiple algorithms are used to analyze the natural behavior of a digital actor. This multi-layer detection is essential to eliminating bot fraud and is why so many companies are using SecureAd to make sure that their advertising budgets are being spent on human users, not bots. Ready to start detecting more fraud? Have more questions? Use the form below!